The Breck Epic MTB stage race has been going down this week in Breckenridge, CO. Five days of riding in a beautiful area. Tomi won himself a free entry to the race and committed to doing it on his fixed gear. He's been reporting in nightly so check out his race reports at his blog. Today is the last day so I imagine once it's all said and done he'll have a mega wrap up on the whole trip when he returns. Outside Magazine has an interview with Chris Plesko who just set the single speed record for the Tour Divide Race finishing in 19 days. Sweet. MB Action talks single speed racing with Fuzzy Mylne. Slow single speeders begin growing beards to see if this is the secret to speed. Seems everyone has a single speed wrench/bottle opener these days. The tool gurus at Park offer up this one. For over a decade I've been going up to Vermont to snowboard. After crossing the state line, as things started to turn white and the steepness of the mountains increased, I'd admire the landscape and drool over the mountain biking possibilities, year after year promising myself to make the trip up in the summer and tap into some singletrack. With friends heading up for an extended stay in the green state, an invitation to visit and no vacations planned, a low budget get-away plan with my wife was hatched. Head up for a week, ride for four of those days and return on July 4th. The Kingdom Trails, an IMBA Epic, was a place I've been hearing about for quite a while and that would be the centerpiece of riding with other various trails thrown in for good measure. First stop on the trip was a quick detour to Centralia, PA. Fascinating but tragic story. After viewing the smoldering landscape, we were back on the road. We were hammered by torrential downpours in New York state and the forecast for the remainder of the week showed rain as well but I remained optimistic that the weather forecasters would do what they normally do and blow their predictions. As it turned out, they were spot on and we got rain everyday we were there. Occasional clear skies followed by some of the heaviest rain I have ever encountered. 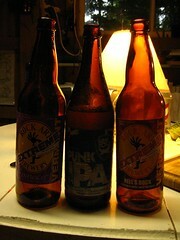 We remained optimistic while eating good food and drinking good beer and waiting out the weather. Mid-week we forged north (we had base camp in East Poutney) towards Burlington in hopes their weather had been a bit better and a brief clear spell would allow some riding. With a little poking around we located the Shelburne Bay trails, full of slippery roots and rocks, some scattered mud patches but overall in good condition despite the slickness. Insider info would have been helpful as it became obvious the loop would be best run counter-clockwise. With a 50% chance of getting it right, we got it wrong. No matter, it was good to get out and pedal and the views from the peak of the bluff overlooking the bay were beautiful. The amount of trail mileage out there is short but was just as well since shortly after loading the car back up massive rain unleashed itself on us as we headed to Magic Hat Brewery. I've got to say, Magic Hat has one of the coolest tasting rooms I've been in a brewery, professionally styled more like a hip hang out than a warehouse afterthought like many places I've been. After sampling all of the offerings we got a recommendation from the bartender on where to get some food. There was a brief break in the rain as we headed into Burlington and ate at American Flatbread. Killer beer selection at this place and the high priced pizza rightly commanded the price due to the excellent taste and fresh, local ingredients. No wonder there is a 45 minute wait on a Tuesday evening. The rain, of course, had returned with a vengeance. We headed to Radio Bean for open mic night and some more beer, extending the night as long as possible to avoid going back to the wet camp site but eventually made our way back to the conveniently located camping at Mt. Philo. At this point the biking portion of the trip was crumbling quickly and a call the next morning confirmed the Kingdom Trails were wet with more heavy rain in the forecast. We scrapped the plan to drive a couple of hours to the wet trails and took a meandering route towards base camp in search of more beer. We got shut down in our attempt to visit the Alchemist brewery due to it's late afternoon opening time and pushed on to Montpelier. 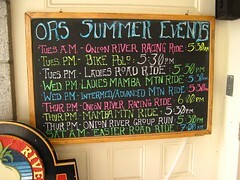 A cool town with a cool bike shop (Onion River Sports). 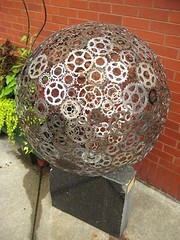 An art project throughout town was comprised of sculptures made of bike parts. Bonus! No brewpub to be found though. The rest of the week continued the pattern of brief spells of sunshine punctuated by massive rain storms as a big weather systems continued to sit over the region. We managed to get a bit of swimming and canoeing in but there was no way any trails would be in rideable condition so the bikes sat lonely and unused. Saturday AM we rolled out of town early and headed south to drier environments and a chance for a MTB ride along the way to break up the long drive. When mapping out our trip route I realized we could easily pass by Bethlehem, PA on one of our options. 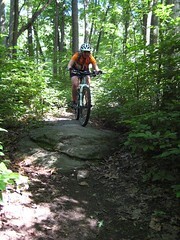 A recent Bike Magazine article highlighted some trails in the area. I did a little digging and found Salisbury Park was about 5 minutes off our route, which meant easy on/off access to make a quick stop appealing. Once on the trails a few friendly locals provided some route info and we got in a couple of hours riding before jumping back in the car and continuing our trek home. 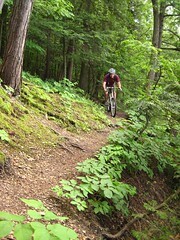 The trails were built by MTBers and it shows. Nice flow, good use of the land and overall good design. 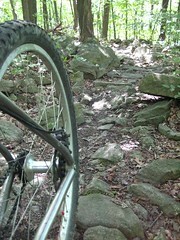 The trails are mostly rolling with a mix of buff dirt interspersed with technical bits. Thumbs up to the locals for both their trail work and friendliness, it was a good way to salvage the disappointing ride portion of the vacation. So the trip wasn't as planned as far as biking went, but there are times things are out of your control so you've got to roll with the punches. Good people, good beer and good food made for fun times, just without the biking. Fortunately I've collected enough info that the next trip up should yield some quality riding if the weather cooperates.